My Own Church Help is a resource for all users who want to learn how to use My Own Church. It is designed to help you quickly get to the information you need to perform a task or understand a concept. The Help system includes reference information for those needing to find a quick answer about a feature or a function as well as "how-to" information for those who need step-by-step instructions to complete a specific task. This topic describes how to use and navigate the Help system. 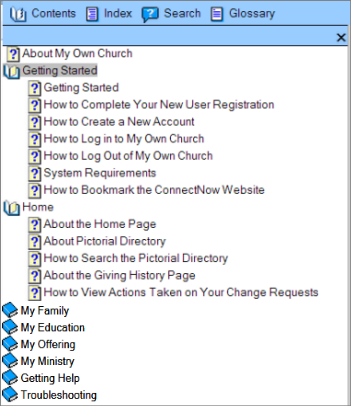 The My Own Church Help option on the Help menu opens the entire Help system. After you open the Help, you can use the navigational aids within the Help to locate specific Help topics. On the Welcome page, log in to ParishSOFT. The first page of the general Help is displayed on a separate browser tab. If you want to open the Help in a separate window so that you can view the Help contents alongside the page in the application, go to Opening the Help in a Separate Window. Help topics can be displayed in your browser either as a split screen, with the navigation toolbar in the left pane, or as a full screen with no navigation toolbar. 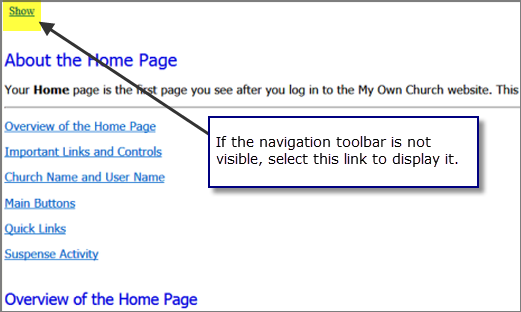 In some browsers, you may need to click the Show link in the upper-left to display the left navigation pane. The following illustration identifies key features of the Help. Depending on the browser you are using, your Help interface may differ slightly from the one shown. The features, however, are the same. Page-specific Help is available only when you are viewing one of the main pages in My Own Church. Page-specific Help provides quick-reference information to give you enough information to perform basic tasks immediately. For example, in a page-specific Help topic you will find short descriptions of individual controls on the page, such as buttons, menus, and options—just enough information to jog your memory about how to use a particular control. 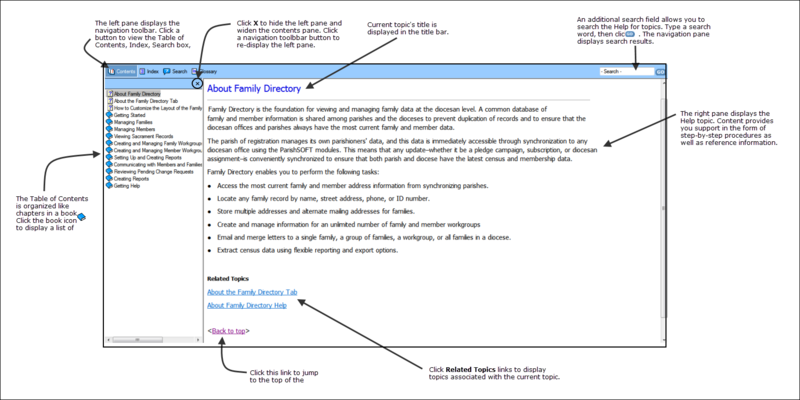 If you need instructions on how to use a particular feature, page-specific Help topics contain links to "how-to" help topics that provide you with step-by-step instructions to complete a particular task. Click a main page button. For example, click to display the Home page. Click to view the list of topics. Then, click to open the desired book. All of the instructional or "how-to" topics begin with the words "how to". Select the desired "how-to" topic from the list to view the instructions. The topic opens in the main viewer. As you read information in a topic, you will come across words or phrases that have a blue underline. These underlined words and phrases are called hyperlinks. Hyperlinks inside of a topic connect that topic to related information. When you click the hyperlink, you immediately jump to the related information. Sometimes the information is somewhere in the same topic you are reading. Other times, the information is in a different topic. To get back to your original location, simply click your browser's Back button. You can also move back and forward by right-clicking your mouse button and selecting Back or Forward from the displayed menu. The lightbulb symbol marks information of special interest, suggestions, and tips and tricks for using features in the application. From a page in the application, select the Help link in the upper-right corner. 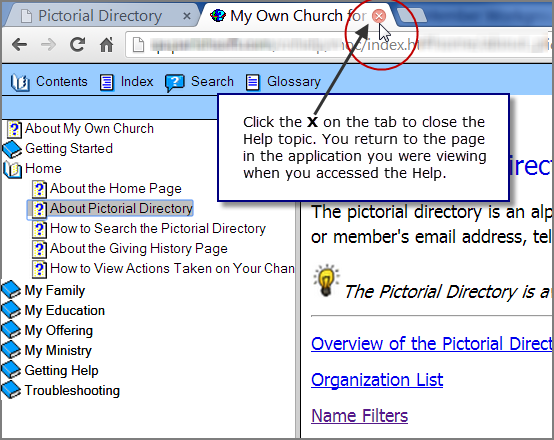 Right-click the My Own Church Help option or the Help with this Page option. 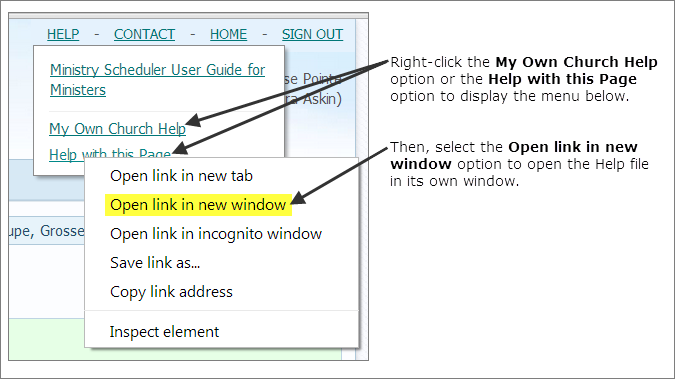 Select the Open link in new window option. The Help opens in a new window. The window may be positioned on top of the application page. You can move the window and re-size it so that you can see the application page. ● Move the Help window. To do this, click and hold the left mouse button on the Help tab. Drag the tab to the desired location. Release the mouse button. ● Resize the Help window. To do this, position your cursor anywhere along the edge window until your cursor changes into a double-arrow cursor: . Then, press and hold the left mouse button while dragging the window's edge until the window is the size you want and the application page is visible. ● Contents: opens the Contents list, which contains a list of titles that link to main topics in the Help. Not all of the topics in the Help are listed in the Contents. Within a topic, you may encounter links to sub-topics that provide Help related to the topic you are currently viewing. Browse through the list to find the topic you need. Then, click the link to open the topic and view the information. For details, see Contents Search. ● Index: opens the Index, an alphabetic listing of words and phrases included in the Help. Search the index by entering a word or phrase. For details, see Index Search. 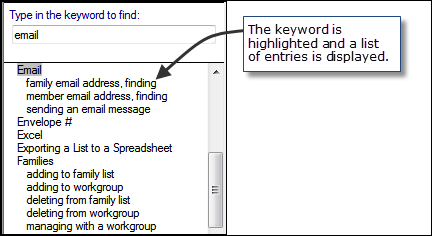 ● Search: opens the Search function, which lets you search the Help for specific phrases or keywords. For details, see Keyword Search. The Contents list organizes the Help content and provides an easy way for you to display a Help topic. To open a book of Help topic, click a closed book icon . The Help topic for the selected title opens in the right pane. To close the book, click the open book icon . 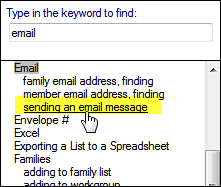 Use the index to search for topics in the Help that contain a specific word. In the navigation pane, click to display the search box. The Help topic is displayed in the right pane. 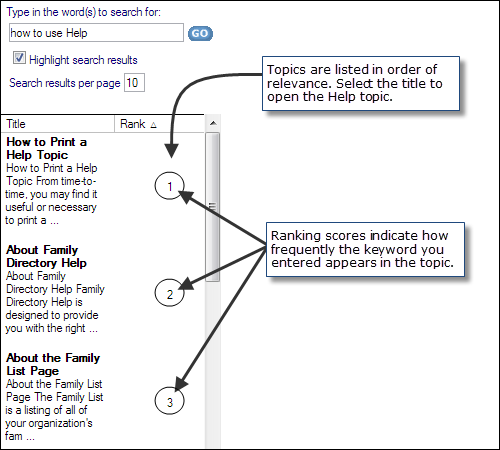 You can search the Help for every topic that contains a specific keyword or keyword string. You can search for multiple words. Just type them in the search box, separating them with spaces. 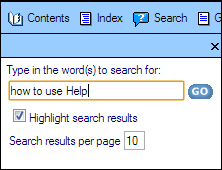 For example, if you are searching for how to use the Help, type "how to use Help" or "use Help". Leave the Highlight search results option selected if you want the keyword highlighted every time it appears in a Help topic. A list of topics containing your search term is displayed in the left pane. Topics are listed in order of relevance, and a ranking score (for example, 1, 2, 3) is displayed to the right of each topic. The score indicates how frequently the keyword appears in the topic. Select the topic title to view the Help contents. If you checked the option to highlight search results, the keyword is highlighted wherever it appears in the selected Help topic. 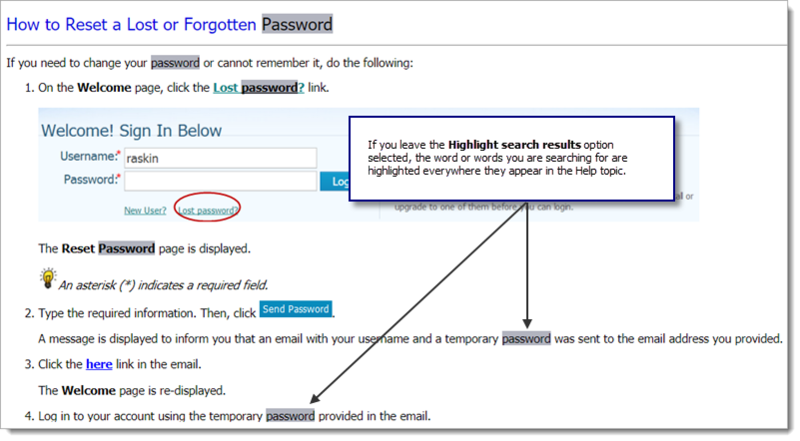 In the illustration below, the user is searching the Help for the keyword "password". So every time the word appears in the selected Help topic, it is highlighted. If you have a long list of search results, use the buttons at the bottom of the left pane to page through the list of remaining search results topics. ● If you click a link on a Help page and, as a result, move to a different page, clicking the Back button gets you back to the page you were on. ● If you click a link on a Help page and, as a result, jump to a different location on the same page, clicking the Back button gets you back to your previous location on the page.